Now I heard it right, so I gotta wonder why they repeat it over and over, as if this old Granny can't figure out what these people they is doin'. They keep sayin' fair and balanced, but what I hear is the kind of talk that goes on over the clothesline in my backyard after everybody finishes washin.' 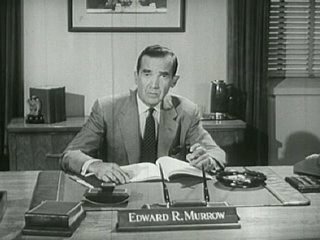 Wish Edward R Murrow were alive today so he could give the news. It's like Jack Nicholson said to Tom Cruise in that picture show about A Few Good Men, "you can't handle the truth." Well, Eddie knew even a fourth grader like me knew the truth from smelly underwear. And I don't need folks talkin' round the bush all day like I ain't got education. I heard some feller yesterday repeatin' what some other feller said just before him, as if that person didn't have his head on straight and couldn't talk real good. I heard that feller sure enough, and I'll bet everybody did. So why did those television people say it over and over again, like we ain't got sense enough to get out of the rain. Well, Granny could skip through a thunderstorm faster than they can think. And after all the newspaper and television people repeat most everything, then the following day they do it again, and so do all my neighbors. Each time these folks gives a story somethings added on, like that children's game where everybody sits in chairs and tells a story and laughs when it gets to the last person when it's different than the first. But these days the guy that gets the story last, and messes it up good acts like he told the story first and looks like he's so smart. They also look so duded up when they are on that television, when all they need is to look at me and smile. Sure, that's enough. Even that little baby of mine, Alicia Keys, she sings so loud and strong she don't need anything fancy on her face, just stands up and sings good. Now why don't those news folks just tell it like it is, cause they can't sing a note, and if they did it would be as sour as my dill pickle. Today I think I'll sit a spell and find my radio and wait for Edward R Murrow, even though I knows he's gone and I'll hear the old stories again. That was so long enough ago, it'll seem brand new. At least he only said things once, and he never said it was fair and balanced; that man just told things plain. Granny: "Shake the apple tree"